Booklets is rated 4.9 out of 5 by 25. Choose the size and fold you need, then customize as you like. "We used the booklet idea and created a magazine to recruit new employees to our company…You guys are the best all in one printer with great quality and fast turnaround options. I live in Arlington so I love coming and picking up vs. paying for shipping." Rated 5 out of 5 by Robyn R from Another good job Attention to detail in the pre-print process was excellent as well as the post production product. Rated 5 out of 5 by tinna from good service they print for a mistake but correct it right a way and ship it to the company on time. No extra charge. Rated 5 out of 5 by Esther from Corporate Policies and Procedures reprint. I am so pleased with the booklets. And ,was I surprised when the order arrived earlier than I expected!! I can't thank PrintPlace enough. It was a pleasure doing business with the company: the employees were so professional and helpful. Rated 5 out of 5 by Excited customer from Great experience Always on time, exactly as ordered. Will order again. 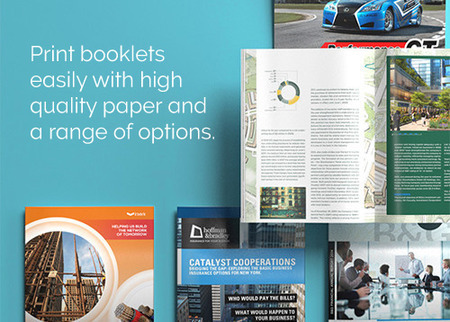 PrintPlace offers nothing but exceptional booklet printing with several options to choose from. Print booklets in four different paper types depending on your preference. Different binding options are available too. Choose between saddle stitch binding and wire-o binding for your binding option. If you need to print booklets right away, you may choose same day printing option for faster turn around time. Saddle stitch binding is a type of booklet binding method wherein the pages of the booklet are folded one inside the other to create a less bulky and more professional booklet. This binding method makes a lighter and easier to carry booklet. Wire-O Binding, also known as wire binding is a booklet binding method that uses wires to put pages together. The wire that binds the pages of the booklet makes a more durable booklet compared to other binding methods. If you aren't sure how to make a booklet, start with one of our layout templates, which give you the exact dimensions your artwork will need to be. The layout templates are available for download through a desktop PC as ZIP files and co, me with three different format options: InDesign CS3, InDesign CS4, and Publisher. Save time and money by choosing our direct mail services. Since we print and mail from one place, your booklets will be in the mail in time for your next promotion or event. Our direct mail services include processing of 1 mailing list, duplication removal if requested, CASS Certification, inkjet addressing, and postal presorting for automation rates, all at an affordable price. Postal prices depend on the size and weight per piece. Check if your booklets will mail at Letter or Flat rates by viewing the mailing requirements. Make a big impact. Because of the multi-page format, there is space to include a lot of information. We are a booklet maker that can help with producing employee handbooks, event programs, cookbooks, membership directories, and more. A coupon booklet filled with special offers for your business is a good start. It’s a great tool for generating new customer leads. This will help you deliver and obtain targeted information relating to your customers. Booklet printing services from PrintPlace can also include mailing services. To save time and money, we can mail straight from the printing press to your target market.